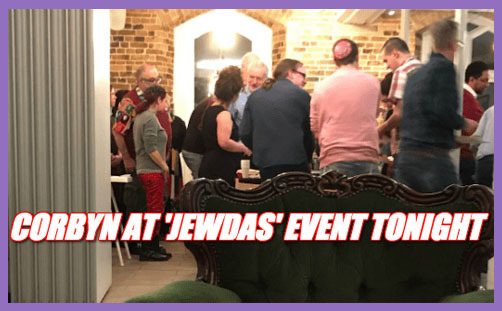 The revelation that Jeremy Corbyn chose to commemorate Pesach (Passover) with the far-left, anti-Israel extremist group Jewdas is incredible – literally incredible. Why would the Labour leader choose to celebrate the most important feast day in the Jewish calendar with a group of Jew-hating, Israel-loathing, hate-spouting extremists? How could any leader of a main UK political party – especially a putative potential prime minister – be so insensitive to the offence and blind to the optics? Surely if Jeremy Corbyn wanted to listen to and engage with the Jewish community, he might have chosen to sup with the Board of Deputies or the Jewish Leadership Council? It makes no sense for a democratic leader – in the midst of an onslaught of allegations of antisemitism (“or any kind of racism”) – to give credence to those allegations by breaking bread with extremists and tarnishing himself by association, does it? Unless Stephen Pollard is correct, and Jeremy Corbyn is fully aware of how it looks and what it means, and is effectively sticking two fingers up to mainstream British Jewry. By choosing to commemorate the Passover with Jews who believe that Israel is “a steaming pile of sewage which needs to be properly disposed of”; and that Stephen Pollard (and Jews like him) are “non-Jews”; and that all this fuss about Labour’s anti-Semitism is just a right-wing plot to smear and unseat him, Jeremy Corbyn is blessing the Jewdas Seder with his presence and thereby affirming their beliefs. Could Jewdas please explain their policy of how Israel should be “properly disposed of“? Forced migration? Deportation? Ethnic cleansing? Holocaust? Theresa May has not infrequently been accused of leading the “nasty party” – a phrase she herself coined at the Conservative Party conference in 2002 – indifferent not only to the plight of the poor and oppressed, but steeped in racism, Islamophobia and homophobia. Surely, if she were intent on a programme of ‘brand decontamination’ and sincere in her efforts to rid her party of every whiff of racism, Islamophobia and homophobia, the last church on earth she’d choose to share communion with would be the Westboro Baptist Church. Would it not be incredible – literally incredible – for the leader of the Conservative Party to choose to break bread with a group of far-right professing Christians who burn the Qur’an in public while calling it an “idolatrous piece of trash”? Or who protest against homosexuality with placards declaring ‘God hates fags’? Or who preach that Barack Obama is the Antichrist and that he forms an unholy trinity with Satan and Pope Emeritus Benedict, whom they believe to be the False Prophet of Revelation? Unless, of course, she were genuinely sympathetic to the beliefs of Fred Phelps, enjoyed his fellowship, and just didn’t give a damn what mainstream Christians thought.